Elsie Poncher says she needs money. 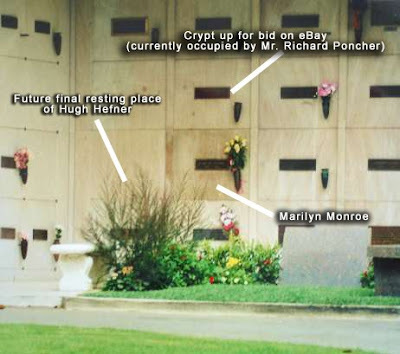 But instead of pawning her wares or otherwise liquidating what most people consider to be normal assets, Mrs. Poncher has opted to sell off what must be one of the most unusual pieces of real estate in the world: she's selling the tomb of her husband at Westwood Memorial Park in Los Angeles. The crypt is currently occupied by the remains of Richard Poncher. It's also located directly above the final resting place of Marilyn Monroe. And what's more, Elsie Poncher is auctioning the tomb on eBay. The initial bidding began at $500,000. As of this writing eBay Item #320412140795 "Crypt Above Marilyn Monroe For Sale" has received 23 bids and is up to $2,750,600. Here is a once in a lifetime and into eternity opportunity to spend your eternal days directly above Marilyn Monroe. This crypt in the famous Westwood Cemetary in West Los Angeles currently occupied above Marilyn Monroe is being vacated so as to make room for a new resident. "Spending Eternity next to Marilyn Monroe is too sweet to pass up", recently quoted by Hugh Heffner, who has reserved his place in eternity next to her. The lucky bidder will be deeded a piece of real estate that he or she will make their last address. And below you will be Marilyn Monroe. In fact the person occupying the address right now is looking face down on her. "In fact the person occupying the address right now is looking face down on her"...?! And she even takes PayPal!